As a home buyer in Atlanta , it’s easy to look at these numbers and think housing markets are down. Ultimately, that may prove true. 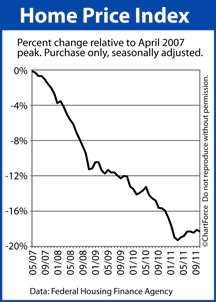 However, before we take the FHFA’s October Home Price Index at face value, we have to consider the report’s flaws. There are three of them — and they’re glaring. As we address them, it becomes clear that the Home Price Index — like the Case-Shiller Index — is of little use to everyday buyers and sellers in places like Bradshaw Farms.